Several important matters arise when we adopt an instrumental view of photography, seeing it as a technology for making images and, thereby, directly opening the possibility of questioning the purposes for which images are made and the uses to which they are put. Among these are related philosophical questions about truth and meaning. Here I want to focus on the latter. Sontag may be correct. But consider the relevant passage from Wittgenstein. In the famous passge from the Philosophical Investigations what he says is: "43. For a large class of cases - though not for all - in which we employ the word 'meaning' it can be defined thus: the meaning of a word is its use in the language." Notice that we would have to do at least two things to sustain Sontag's claim. First, one would have to universalize Wittgenstein's remark; he does not define meaning as use, he says that for some large but indeterminate number of cases - but explicitly not for all - when we talk about meaning we are talking about use. The clear inference is that sometimes when we talk about meaning we are talking about something else. Then, second, we would have to establish that photographs are enough like words that it is through the ways they are used that photographic images accrue meaning. I am amenable to these moves, I think. The first, generalizing, move seems warranted in part because Wittgenstein himself seems to make it when, in On Certainty for instance, he says "it is only in use that a proposition has its sense." Here the caveats fall away. The second, analogizing, move seems right to me (as it should also to the many critics who treat photography as a language or means of comunication). But notice that this might pose a problem for Sontag and those like her who deny that photography can be used, like language, to sustain narratives. Thus, note that in the line from On Certainty Wittgenstein already has moved from words to propositions as the bearers of meaning. And notice too that all this discussion raises the question of what it means to "secure" the meaning of a word or propostion or photographic image beyond the uses to which it is put. Sontag seems desperate to identify some consoling place from which to be sure that meaning is secure. 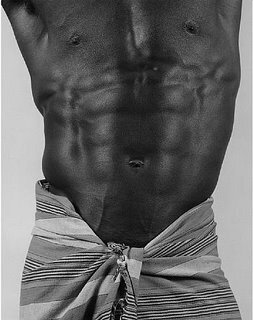 This picture is entitled "Derrick Cross, 1983" (© Robert Mapplethorpe) but one might also consider a whole series of photos on black men that he did, especially those of Ken Moody. Of course, this comparison raises all manner of questions regarding sexuality and the way it figures in the themes of pain and violence and sports and exploitation. 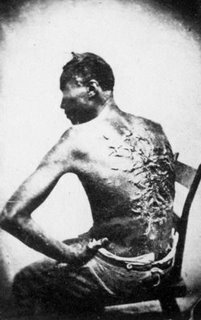 The picture - "The Scourged Back" - was taken in Louisiana in 1863 and figured prominantly in the recent ICP exhibition Only Skin Deep: Changing Visions of the American Self that is currently touring the US. In any case, this comparison reflects the intimate connection between historical relations of domaination and subordination and the ability/willingness of those who are dominate to inflict markings on the bodies of the subordinate. Finally, the "Branded Head, 2003" photo in particular seems to me to raise important issues about the uses of celebrity. Consider this passage from Susan Sontag: "A portrait that declines to name its subject becomes complicit, if inadvertantly, in the cult of celebrity that has fueled an insatiable appetite for the opposite sort of photograph: To grant only the famous their names demotes the rest to representative instances of their occupations, their ethnicities, their plights." We can set aside the irony of this passage being penned by Sontag who surely embodied celebrity and used it for various purposes. Thomas seems to me to use this faceless image to exploit celebrity. It straddles the gulf that separates the more or less anonymous "masses" who daily don clothing and shoes emblazoned with the swoosh and the global celebrity enjoyed (?) 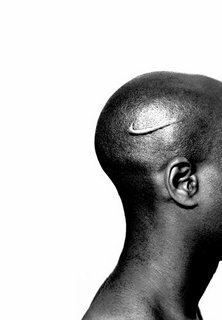 by the iconic bald African-American Athelete who more or less single-handedly put Nike on the corporate and cultural map world-wide. The famous and the anonymous alike, as well as many who occupy positions intermediate between the two, are indelibly marked by this logo. And, of course, this logo merely stands in for its several competitors. I just encountered these images by Hank Willis Thomas. They are part of his B®ANDED works that intermingle reference to the brands that marked slaves as property in the US, the brands that have been central to Fraternity rituals among African-American men, and the corporate logos that brand sports figures - from celebrated professionals to unknown local kids. His images turn the corporate logos back upon themselves to focus forcefully on the ways violence and race and property and commodification and exploitation are embodied in American society. This work is part of Thomas's response to the death of his cousin, who was murdered in a petty robbery - adding themes of kinship and vulnerability into those mentioned above to bring home the point that systematic patterns (not actually random and senseless) have personal consequences. You can find an interview with Hank Willis Thomas here. As a follow up to my last post, I would call your attention to an essay my friend Henry Farrell wrote for the Chronicle Review earlier this fall on the relative scarcity of academic bloggers. So I apparently stand at the intersection of the aged and dweeby, what a combination! By the way, Henry blogs with a bunch of his friends at Crooked Timber which is linked in the sidebar to your left. I highly recommend them. Now this from the AARP Bulletin (December 2005, Vol. 46, #11, page 6) - "Only 0.3 percent of the Internet's estimated 53.4 million bloggers are age 50 or older according to a recent study by Perseus, a Web survey firm ...". That makes me a member of a select group, huh? Several things strike me as troubling with this premise. First, Solomon-Godeau makes an extremely strong claim about the "possible" impact of images which, she insists, necessarily is fleeting. As if she recognizes that she has over-reached, Solomon-Godeau immediately, if tacitly, retracts the extreme claim with the modifier "generally." Second, her premise revolves around the photographic image and what it does rather than how specific agents (say, Jaar whom she praises, or Salgado whom she disparages) use photography. These two features of Solomon-Godeau's view combine to lead us astray in thinking about the ethics of representation. Solomon-Godeau's first point, of course, is quite contentious. Susan Sontag, for instance, insisted that photographs of suffering "haunt us." Not just that, Sontag issues a plea for this: "Let the images haunt us. Even if they are only tokens, and cannot possibly encompass most of the reality to which they refer, they still perform a vital function. The images say: This is what human beings are capable of doing - may volunteer to do, enthusiastically, self-righteously. Don't forget." If Solomon-Godeau is right, or even close to it, Sontag clearly must be asking the impossible. And, of course, Sontag worries that the spaces within which the struggle against amnesia might take place are not just rare, but progressively endangered. This is where the focus on photographs and what they do is disabling. For when we focus on the photograph as an object instead of examining how particular agents use photography, we invite a sort of fatalism. Sontag was susceptible to that fatalism. But in terms of the ethics of representation what is most important is what artists like Jaar (and, say Krzysztof Wodiczko) do with images that looms so large. Sontag seems to assume that viewers require solitude to fully absorb images of suffering and, thereby, to resist the forgetting that threatens to swallow the events pictures capture. I am not sure that solitude is quite right. In fact, it seemingly places the ethical imperative solely on the viewer and her response rather than seeing the ethics of representation as being an interaction between viewers, the subjects of the images and the person(s) presenting them. Jaar, for instance, presents images or, often more provocatively, constructs installations that are in one or another way parasitic on images. And he does so in ways that operate along several dimensions. Most obviously his work aims to establish solidarity with (often by bolstering memory of) those who suffer various sorts of human depredation. Hence, David Levi Strauss remarks that Jaar's work Rwanda in its various incarnations "haunts our memory." But at the same time, in creating his installations Jaar seeks to carve out spaces where viewers - individually or in groups - might actually engage in contemplation of the sort Sontag rightly deems especially precarious. Granted, Jaar does not rely solely on images, but he often does. It is important to see, however, that it is the way he uses photography rather than the images themselves that hold out ethical and political possibilities. These endeavors (like those of others who use photography for various purposes) may or may not succeed. Indeed, I already have commented on Jaar's claim that his works typically fail. The point here, though, is different. Ethical assessment bears on actions and interactions (or perhaps on states of affairs such as institutions) not on objects. Solomon-Godeau obscures that crucial point. The Condi-palooza tour last week defies comprehension. It seems to consist in a combination of these claims: (1) We do not torture, BUT (2) We still need to rely on a network of secret prisons and policies of extraordinary rendition, AND (3) Our allies have benefited from our practies in terms of forestalled terrorist attacks, so they ought to stop complaining. Unsurprisingly, the "liberal" US media seem to be more or less wholly supine on this. I was listening to Diane Rehm on npr as I drove in to the University friday morning. I know listeners love Rehm but her show is politically insipid. She regularly hosts right-wingers and provides wide latittude for their dissembling and spin. On friday the news roundup featured the bombastic Jim Angle from Fox News. He repeatedly did three things typical of right wing appeasement on torture. First, he played the legalism game - "this" is, and "this" is not torture. And everyone should read the statutes and treaties to see that e.g., waterboarding is not torture. One listener called in and asked a simple question: Suppose you were detained by the government and questioned using such techniques; would you think you had been tortured or not? Neither Angle, nor Rehm, nor the other participants offered a direct reply. 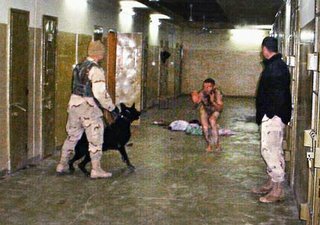 Second, he tried to deny that torture is adminsitration policy for BushCo - insisting that events at Abu Ghraib, Guantanamo etc. are simply unauthorized excesses. Finally, he reiterated the claim that nearly everyone would condone using coercive measures on "high value" detainees, meaning those who we know or are quite confident are terrorists. Angle's second claim, is simply hallucinatory - see the following stories from SPIEGEL ONLINE and the Guardian Unlimited. As for the final claim, this is a rhetorical gambit intended to push torture critics onto a slippery slope. First, it is commonplace and common sense that the "information" elicited by "coercive methods" must be treated as -to be charitable - suspect. Second, how do you "know" you have a "high value" detainee? And finally, how many of the detainees who have been tortured at Abu Ghraib or Guantanamo or elsewhere in our network of secret centers can plausibly be deemed "high value"? As an antidote to the right wing gambit I would recommend reading the exchange between Alan Dershowittz and Elaine Scarry in Torture: A Collection edited by Sanford Levinson. Scarry, I think, skewers Dershowitz on just the sorts of ploy that Angle rolled out. And, of course, the use of torture invites others to do so in reponse. It is simply disingenuous for administration apologists (like John Yoo) to dismiss this entirely predictable consequence (based on the legalism that only other states are committed to international accords banning torture and - Mr. Angle, please take note - cruel and inhumane treatment). Also it is disingenuous to ignore the likelihood that others are not willing to differentiate morally between our torturers and the torturers who work for the bad guys. A final thought, isn't it wonderful to see the American right who fulminate about absolute values as they scurry to exploit loopholes and dissemble and equivocate on this issue? Too late! This looks like an interesting program. Driving in to work this morning I heard on NPR a story about a new line of argument adopted by Saddam Hussein's defense team in Baghdad. A defense lawyer was questioning a witness who had been brought in to testify regarding her treatment by Hussein's Security Forces. She had been arrested and detained at Abu Ghraib where, she testified, she was abused and forced to strip naked in front of the guards. Hussein's lawyers asked her: "Were there dogs present?" and "Did the guards photograph you?" to which the witness answered "no" in both cases. My point is not that as a "legal" argument this is somehow exculpatory of Hussein and the documented atrocities for which he is responsible. Instead, the point - seemingly obvious to everyone outside the Bush administration - is that there is a very large audience out there for whom the lines distinguishing between the behavior of Hussein's minions and the actions of American military personnel are blurred at best. Memo to BushCo: (1) Policies Have Consequences; (2) You are not in control of the message/image. Solidarity: What Counts as Success or Failure? "In a way, the question is: are we allowed as artists to create art out of suffering? Or should we let these tragedies sink into invisibility? Why can't I resist their invisibility in the media and offer my own reading, my own image, my own outrage, my own accusations about this tragic situation? To create these works is not only to put Rwanda on the map but is also a modest way to express solidarity, to create as I did, a memorial for the victims of genocide in Rwanda. Now, how many gestures of solidarity have you seen? This is a memorial for one million people. 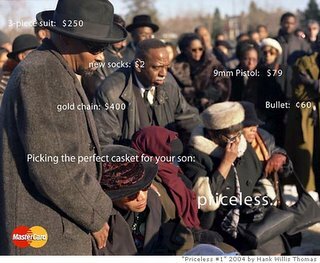 What is this worth?" "Rwanda required me to shift my perspective quite radically. If I spent six years working on this project, it was trying different strategies of representation. Each project was a new exercise, a new strategy, and a new failure. I would learn and move on to the next exercise that would also fail and so on. Basically this serial structure of exercises was forced by the Rwanda tragedy and my incapacity to represent it in a way that made sense. . . . These exercises were a response to the dimensions of the tragedy and my incapacity to communicate this to an audience that, in most cases, did not want to hear about it. I was at a loss. I spent almost a year before I started to create these works. And then I felt that I had to keep trying new strategies, but was always frustrated with the results. It is true that after the Rwanda project, I gained a new insight on images and photography. I was never the same again as an artist. . . . I am suspicious and disillusioned about the uses and misuses of photography in the art world, the press, and the world of entertainment. And to make things more complicated, I don't think that the general public is well educated regarding images. Generally we are taught how to read, but we are not taught how to look." Jaar's severe self-assessment raises several important points. For the moment two are pressing because they provide the basis for challenging his claim that his Rwanda projects failed. First, what does it mean to, in Jaar's words, "express solidarity" with those enduring nearly unimaginable suffering? This is a complicated question and I here address only a single dimension of it. Philosopher Agnes Heller notes that solidarity involves demanding recognition for the needs of others. She insists that solidarity "has noting to do with need satisfaction" but instead is addressed to the (analytically prior) task of demanding that heretofore unacknowledged needs be recognized. Jaar successfully expressed solidarity by trying to secure recognition for those who suffered the Rwandan genocide. He aimed, quite literally, to rescue them from invisibility. The step from there to designing and implementing a political program that might alleviate mass suffering of the sort Jaar witnessed in Rwanda is massive and collective. So, while Jaar may justifiably be disappointed that his work did not provoke greater response among the privileged and powerful, he surely did not fail in his effort to express solidarity. Quite the contrary. Anyone familiar with his Rwanda projects will acknowledge that they forcefully demanded recognition for suffering to which most of us remained willfully indifferent. Second, how does Jaar know that he failed to generate solidarity among those who viewed his Rwanda projects? He himself speculates to the contrary: "Tens of thousands of people have seen the Rwanda Project in dozens of cities around the world. If only a small percentage of the viewers are affected, this is still a few thousand people who will look at Rwanda and Africa in a different way and perhaps express their solidarity." Moreover, does the effect of public art or of any other statement or action have to be immediate? Here I am reminded of the argument that critic/writer/activist Rebecca Solnit advances in her Hope in the Dark: Untold Histories, Wild Possibilities (Nation Books 2004) about the delayed, circuitous way that actions and demands make their way into and through the world of politics. Jaar may have had greater impact than he allows. Solidarity works, if it works at all, only when coupled with hope. "I still believe in the capacity of culture ... to make a difference in our lives. ... I still believe, because we have no choice, that the world of culture is the only space left in the world today where we can speculate and suggest new ways of understanding the world - the only place where we can dream. I have seen enough to be a pessimist, and I am a depressing character [laughter], but I think we have no choice. Hope or nothing."